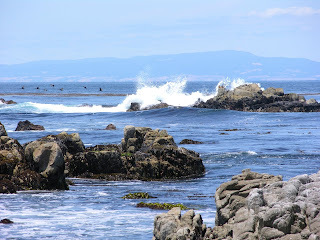 This past weekend Beta Wife and I took a trip to Monterey Bay to see the much talked about aquarium, and of course, to eat as much food as possible. We were fortunate enough to have a friend living in the area to steer us in the right direction, otherwise I’m afraid we’d have left sorely disappointed by our lack of dining options. Living right outside of San Francisco, it’s easy to forget how spoiled we are, having so many amazing options when it comes to eating out between the city and the East Bay. But that’s not to say they don’t exist in Monterey, it’s just that it’s a little harder to be impressed. 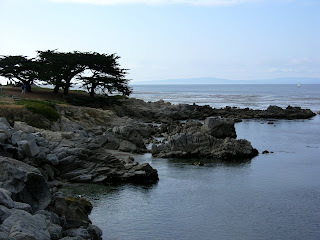 Here are few places you’ll want to check out if you happen to visit Monterey. And you definitely should, if only for the harbor seals. A British style pub with lots of good beer on tap and fairly authentic English fare (this may not appeal to everyone), and lots of quirky personality that you might expect from a pub with a nautical theme. Though I wouldn’t recommend the fish and chips, we also tried the Nelson’s Cottage Pie that arrived in a charming loaf shape and was topped with lots of salty brown gravy. It was one of those dishes that while you’re eating and trying to decide whether or not you actually like it, you find that it disappeared but can’t quite figure out how. We agreed that had the food come on an old beat up tin plate it would have tasted even better. Unfortunately due to consuming too many pints of Fuller’s Extra Special Bitter, there was no room for dessert despite a hearty recommendation for the sticky toffee pudding that our friend described as “brilliant.” There will definitely have to be a next time. After emerging from the Monterey Aquarium after four hours of (literally) rubbing elbows with small ill-behaved children no doubt carrying various upper respiratory illnesses, and the throngs of equally ill-behaved parents pushing oversized strollers carrying more of those children…my blood sugar was low. I needed some food and a drink, and I needed them to be far from the aquarium if I were to muster the energy to return to see the otter feeding. Willy’s Smokehouse looks like a terrible chain restaurant from the outside and clearly someone went a little overboard on the branding. While debating whether or not to go in after glancing at the menu, I noticed the waitress bring out a trio of barbeque sauces to a table outside. I was sold. I am sucker for a trio of sauces. Overall we were both pleasantly surprised by the food, and the service was excellent. I even let the server talk me into ordering a beer made with passion fruit. 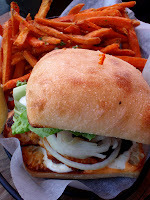 We split the hot wings and a pulled pork sandwich topped with jalapeno slaw—both were very good. The pork was moist and not overcooked, and there was plenty of it. They have a full bar with a good local beer selection, a detail almost as important as how nice and clean the bathrooms were. Almost. We were wandering around the area near our B&B looking for a place to grab a drink before dinner. The smells and packed dining room lured us in for dinner as well. We had a margarita at the bar, decent, but not fantastic. Dinner, however, was another story. It was so good I needed my emergency pants, but alas, I left them at home. We split two dishes that were on the specials list, the chicken mole enchiladas and the steak tacos. The enchiladas were filled with moist shredded chicken that had been smothered in a rich mole sauce, it was one of the best enchiladas I’ve eaten at a restaurant. The tacos were also very good, filled with grilled steak and served with rice that was actually fluffy, seasoned black beans, and a ridiculous amount of cheese, lettuce and guacamole. All of it very, very fresh. And of course the fact that the chips were served with two salsas was another point in their favor. Good stuff. Do you get it? Ol’ Factory? Ha. Funny stuff. It took me like, five minutes to catch on. I had not yet had my coffee. This was our favorite place overall, so much so that the wife and I decided that we’d drive up to an hour to eat there on any given day. Unfortunately, it’s a good two hours away from us in Sand City. First of all, it’s in a great space—an old car garage with high ceilings and big rolling doors. Second they have coffee (including espresso bar) and a really nice beer selection for the evening. Or afternoon. Or after you’ve had your coffee. We split the bacon cheese burger served with a cup of ranch (they got soooo many points for that) and massive, crunchy onion rings, as well as the grilled chipotle chicken sandwich (recommended by our barista) that was served with some of the best sweet potato fries I’ve ever had. And if that wasn’t enough they have giant fresh baked cookies. They’re as a big as a plate. A really thick plate. My final opinion: Best place ever. Okay, one more thing, just so I give them ample credit. 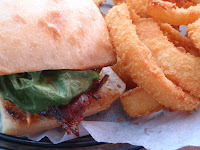 The chicken sandwich was fantastic, and I don’t do the whole grilled chicken thing. If there’s chicken on my sandwich, then it better damn well be fried. I’m certain it’s the best grilled chicken sandwich anywhere on earth. Thanks to Brendon and Cara for the advice.